I’ve been powering through some pattern layouts, and I have a collection of vanilla sock patterns that have just been released. Double Vanilla is a pair of plain sock patterns – one toe-up and one cuff down – in three sizes with several heel and toe options. The Fluevog Effect is the pattern I designed for an event at the Portland Fluevog store, and features Three Fates Yarns half skeins in colors designed for the event. 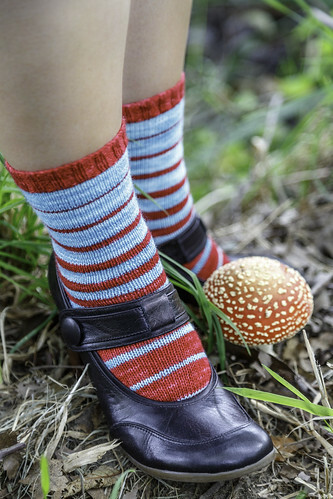 October Rust is a toe-up striped sock knit with approximately 50g of the main color and 4 10g miniskeins. It would also be a great way to use up sock leftovers! And, if you want all three, they can be purchased on Ravelry as a group for $9. This applies to previous purchases as well – if you already bought one the discount will apply to the other patterns if purchased in the future.